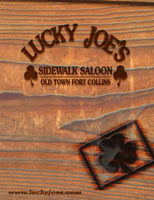 Lucky Joe's Bar and Restaurant Specials – Fort Collins, Colorado’s premier Sidewalk Saloon, Food Beer Wine Spirits in Downtown Ft Collins, CO offering music events concerts catering parties. Also $4 Jameson & ginger ales. 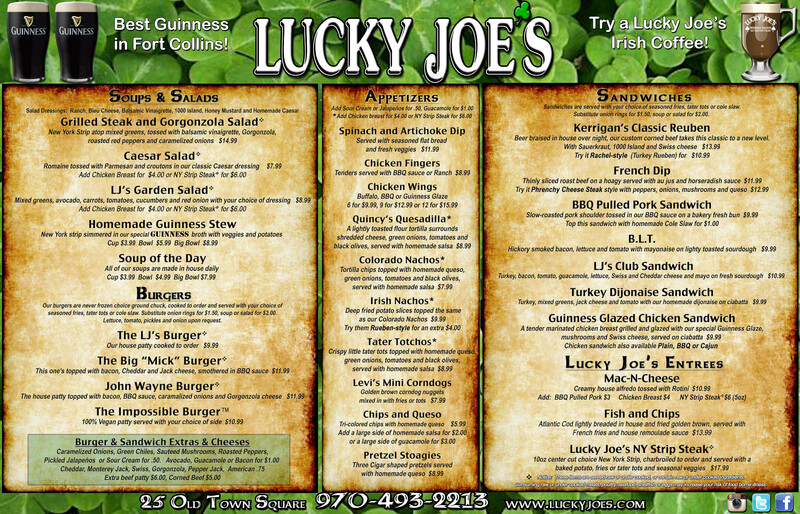 All Day Happy Hour featuring $2.00 Bud Light and Coors Light Draughts, $2.50 Well Drinks, $2.50 Micro Draughts, $5.00 Guinness and $1.00 off all Glasses of Wine. Also $4 Jameson & ginger ales. Casi's Homemade Spicy Green Chili along with Bloody Marys and WELL VODKA drinks are just two bucks all day and night.